OWC announced today that it has released new software drivers that expand Boot Camp support to its entire SSD lineup. 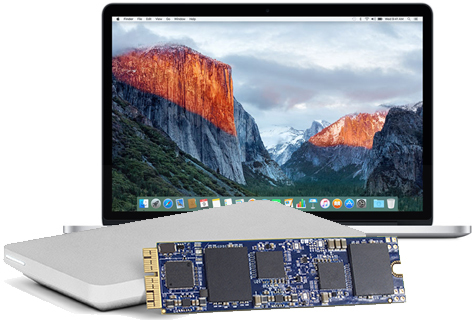 The "Dual Boot Enablers" are available as free downloads on OWC's website for multiple previously unsupported SSDs, including the OWC Aura SSD for Mid-2013 and later MacBook Air and Retina MacBook Pro models, OWC Aura SSD for the 2013 or newer Mac Pro, and the Mercury Accelsior S and Mercury Accelsior E2. Boot Camp enables Mac users to partition their SSDs or hard drives and install Windows directly on the machine, allowing for OS X and Windows to be run side by side. It differs from virtualization software like Parallels and VMware Fusion, which allow Windows to run within OS X itself as essentially a desktop app. OWC's Dual Boot Enabler can be installed on Macs running OS X 10.6.8 or later. OWC, overpriced crap! Horrible customer service, horrible, slow, and overpriced products with a "MAC compatible" sticker. Wow! My experience with them is one of the BEST sources for accessories for my Macs, that's not just selling products that Apple themselves make. Disclaimer: I don't work for them but I assume you similarly don't work against them, so consider my post purely consumer-based counterpoint to your post. How is it "side by side" when you have to reboot to choose one or another? eBay has plenty of them. Just do a search for 'Apple Samsung SSD'. Prices are similar to OWC but you are getting same part that Apple uses and with better read and write speeds. What in their SSDs was preventing this from happening already? Are their SSDs not like regular SSDs and are something special? Because whenever I see such an extreme case for or against some point as I saw in that one, I step in and take counterpoint against such extremes when I know the topic is not as bad as implied. Sometimes, my counterpoint will be met with being called a shill for "them" (whoever "them" might be in such situations) and so I proactively disclaimed that away. In my own case, I have purchased many good accessories for my Macs over many years from OWC and like what I got for my money. Again, they are not just a Mac reseller (of Apple-created products). Instead, they actually make and/or assemble accessories that help me get more out of my Macs. Is everything they make perfect? No, but I could say the same about Apple products too. What I can offer in counterpoint to that guy's extreme bash is that I've not personally had such problems or issues, and actually think of them as a pretty good source of stuff to work with my many Macs. Avoid OWC's Envoy external USB-powered SSD. Mine constantly self-ejected. I sent it to OWC for inspection. They returned it (unassembled!) and declared it fine. Problem persisted. Meanwhile, I purchased another brand and had zero issues. I returned the Envoy and requested a refund. They refunded only a fraction of my cost even though the drive had a two year warranty. Considering my shipping costs too, I was out $85 even though the drive was a lemon. They acted as if they did me a favor by not charging me the customary re-stocking fee! I'll take 1,000 dozen please. Seriously though, how much and from where? Ha ha! I found one on ebay from a local seller that cost me $500 for a 1TB drive. Worked seamlessly. And I sold the 128gb drive for $200, so $300 cost for a 1TB drive that I shouldn't have to change for 2-3 more years. And I had to take it into the Genius Bar once. Was a little worried they would notice something (and they may have) but since it was a drive from an Apple Machine, they never said a word! Really? What was the hold up? Just buy yourself a flash drive pulled from a mac pro and plug it into your macbook pro retina or imac and you are good to go. those mac pro drives are a dime a dozen.